Theme: "Going Down the Road" - Just three of the Fifty Ways to Leave you Lover. 20A: Shed some pounds: TAKE OFF WEIGHT. 38A: Divide earnings equally: SPLIT THE PROFITS. 57A: Talk to the answering machine: LEAVE A MESSAGE. Argyle said: Nice little Monday starter. I have no problem with the first answer being two words and the others just one, but then, I'm not a purist other than wanting the words to show up in a dictionary somewhere. 10A: 1960s-'70s NBA center Thurmond: NATE. One of the greatest rebounders and shot blockers in basketball history, Nate owns a well-known restaurant, Big Nate's Barbeque in San Francisco. 14A: Former Apple laptop: I-BOOK. 15A: Eurasian boundary river: URAL. Or mountain range, as we just had. 17A: Marsh grass: SEDGE. Remember SEDGY? 18A: Italia's capital: ROMA. In the Italian language. 19A: "I'll be there in __": A SEC. 23A: City square memorial: STATUE. 28A: Begins: STARTS. and 22D: Beginning, informally: GET-GO. 31A: Woodsy route: TRAIL. where you don't want to meet 33A: Bear: Sp. : OSO. 37A: Either of two Modesto-based vintner brothers: GALLO. Ernest & Julio Gallo, here in their younger days. 51A: Topeka is its cap. : KAN.
63A: Move, to a Realtor: RELO. 64A: Scatter, as seed: STREW. 66A: Former Lacoste partner: IZOD. Former partners, huh. Who gets custody of the croc? 1D: Dukes in boxing gloves: FISTS. "Com'on, put up your dukes"
2D: Pound __: cover one's route, cop-style: A BEAT. 3D: Screwdriver liquor: VODKA. Which can lead to 26D: Leans to one side: TILTS. and 27D: Wade through the shallows: SLOSH. Not the wading part, the slosh part. 5D: Barely make, as a living: EKE OUT. 12D: Prufrock creator's monogram: TSE. T.S. Eliot, wrote the poem, "The Love Song of J. Alfred Prufrock". 33D: Schindler of "Schindler's List": OSKAR. 34D: Former veep Agnew: SPIRO. 35D: Classic boy-and-dog Disney film: OLD YELLER. I won't say much about it, in case C.C. hasn't seen it. 47D: Dwarf who needs tissues: SNEEZY. 48D: Big name in small planes: CESSNA. 49D: Day to put all your eggs in one basket: EASTER. 52D: Pop singer Lavigne: AVRIL. 54D: French Revolution journalist: MARAT. Jean-Paul Marat (1743 – 1793) was a Swiss-born physician, political theorist and scientist better known as a radical journalist and politician from the French Revolution. He was murdered in his bathtub. 56D: Full of the latest happenings: NEWSY. 60D: Stylish '60s Brits: MODS. The Mods were in conflict with the Rockers. In a nut shell, the Mods(modernists) wore chic clothes and rode motor scooters, while the Rockers were in denim and leather and rode motorcycles. 62D: "The Simpsons" Squishee seller: APU. Theme: Right on Cue - QU is added to the starts of the first words of familiar phrases. 32A. Annul the middle of the week? : (QU)ASH WEDNESDAY. This tipped me off the theme. 49A. Calculation for an express delivery? : (QU)ICK FACTOR. Ick Factor is a measurement of the repulsiveness of something gross. 66A. Ends it, to one's subsequent regret? : (QU)ITS A GOOD THING. It's a Good Thing. 85A. Sick feeling on campus? : (QU)AD NAUSEAM. Ad Nauseam. 99A. Wasn't quite ready to accuse? : (QU)ASI SUSPECTED. As I Suspected. I have difficulty understanding the new phrase. Confused by the grammar structure. 112A. Muslim household's holy book? : (QU)RAN IN THE FAMILY. Feels like the base phrase should be "run in the family', no? The only non-theme QU today is QUE (28A. Juan's "what"). Total 8 Q's in the puzzle. Plus 3 Z's, 3 J's, 3 X'es and 7 K's . Quite a scrabbly pangram (all 26 letters are used at least once). In fact, it's a triple pangram. In his last themeless Saturday, this constructor Peter Wentz used four J's & eight K's, quite unusual for a 15*15. Maybe scrabbliness is his style. Again, I grokked the theme very early on and it sure helped my solving. Many times understanding the theme early has no impact on my solving, esp pun themes. Today I was able to fill in every QU in the Across theme answers and then cracked the intersecting Down entries, which are mostly solid words/phrases and easily obtainable. 4. Copy room malfunction: JAM-UP. Printer malfunction too. 9. Parchment? : THIRST. Too cute a clue for me. 15. Island band The __ Men: BAHA. Here is their annoying "Who Let the Dogs Out". 19. Like single-digit temps: ABOVE ZERO. Nice multi-word entry. 21. California's motto: EUREKA. Know this because of our CA gang. 22. 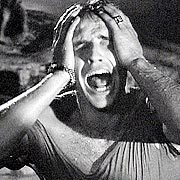 "Son of Frankenstein" role: YGOR. Or IGOR. 27. Juan or Gabriel lead-in: SAN. San Juan & San Gabriel. 29. Bridget with a diary: JONES. From movie "Bridget Jones's Diary". 30. Arles article: LES. As in "Les Misérables". 35. Sailor's destination in a Yeats poem: BYZANTIUM. Yeats's "Sailing to Byzantium". I wrote down BYZANTINE. 42. Prefix with directional: UNI. Unidirectional. Penned in ERN, it's actually "Directional suffix". 46. Z4 automaker: BMW. Car make/model is definitely my weak point. 54. Winning game line: OOO. Tick-tack-toe. 55. Narrow furrow: STRIA. The answer emerged itself. 57. Big name in water filters: BRITA. No idea. No filter in our kitchen. 69. To an extreme degree: AWFULLY. Did you know immediately that the clue is asking for an adverb? 73. Twosomes: DYADS. Dy(0) is a prefix for "two". 76. Gustave who illustrated classics: DORE. Stranger to me. Gustave Doré (French) illustrated Cervantes's "Don Quixote". Poe's "The Raven", Milton's "Paradise Lost", etc. 91. Year in Nero's reign: LIX. Roman numeral 59. Very frustrating clue. Nero ruled from 54 to 68 A.D.
92. Corned beef holder: RYE. Reuben sandwich. 96. Old bath water quality: TEPIDNESS. Odd use of "old". 104. Mazatlán Mrs.: SRA (Señora). Then we also have MMES (82D. Fr. titles). Madames. 105. Chill out, slangily: UNLAX. New slang to me. RELAX wouldn't fit. 107. Ones bound by blood: KIN. I often forget that the plural form of KIN is still KIN. 108. Chant at a Lakers game: KOBE. Kobe Bryant. Stumper for me. 120. 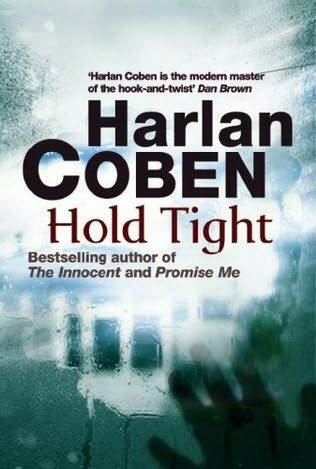 2008 Harlan Coben thriller: HOLD TIGHT. No idea. See the book cover. 122. Leapt: SPRANG. A bunch of consonants. 123. Premium movie channel that dropped its "!" in 2005: STARZ. Unknown to me also. I don't think we have this channel. 1. Helpful URL link: FAQ (Frequently Asked Questions). Nailed it. 3. Overcharge, in slang: SOAK. Learned this slang a few months ago. 4. Long-time CBS news anchor Jim: JENSEN. He died before I came to the US, so no, I don't know him. 5. HIV-treating drug: AZT. The first drug approved for the treatment of AIDS. Have never heard of it. 6. Part of RAM: Abbr. : MEM (Memory). RAM = Random Access Memory. Desperate clue/answer. 7. Sch. whose mascot is Rhody the Ram: URI (University of Rhode Island). I failed again. 11. Controversial conflict since 2003: IRAQ WAR. Great fill. 13. Hit the slopes: SKIED. Hit is past tense here. 16. Planning aid: AGENDA BOOK. I just call it personal organizer. 17. Old Testament prophet: HOSEA. Minor prophets. 20. Instrument featured in Berlioz's "Harold in Italy": VIOLA. Easy guess. 29. Civil rights activist Jackson: JESSE. Reverend Jesse Jackson. I bet he wishes he could grab the spotlight and offer Tiger Woods some help. 31. Double __ Oreo: STUF. First time I saw this entry in a Xword. 32. Baked brunch dishes: QUICHES. Yummy. 33. 116-Down's last VP: HST. And FDR (116D. See 33-Down). 38. Sworn __: given the oath of office for: IN AS. Doubt I'd get the AS part without the crossing help. 44. Actress Meyers: ARI. So happy I finally remember her name. 47. Whacked arcade critter: MOLE. Was ignorant of the Whac-A-Mole game at all. 52. One with an option to buy, perhaps: TENANT. Nice clue too. 58. Herbal quaff: RED TEA. Chinese call black tea as RED TEA. 63. Fight in a ring: BOX. Verb. 67. "The Seduction of Joe __": Alda film" : TYNAN. Have faintly heard of this film. Someone must have mentioned it at the Comments section before. 69. Fast and furious, e.g. : Abbr. : ADJS. Excellent clue. Both fast and furious are adjectives. 70. Makes a play for: WOOS. "Make a play for" is a new idiom to me. 71. 1989 Tom Petty hit: FREE FALLIN'. Here is a clip. It's not stored in my memory. 74. Big name in snowblowers: DEERE. Toro too. 78. Rhoda's mom: IDA. Again, got her name from crosses. 80. Sassy one: SNIP. Unaware of this definition of snip. 84. Attach: AFFIX. Wrote down ADD TO first. 85. Duck chorus: QUACKING. Lovely. 89. City near Buenos Aires: LA PLATA. No idea. See the map. Literally "The Silver". 90. Backer of Fidel: CHE (Guevara). They were comrades. 94. Answer to one's own rhetorical question, perhaps: I SAY NO. Nice answer. 96. Dimes, to dollars: TENTHS. Did not come to me easily. 97. 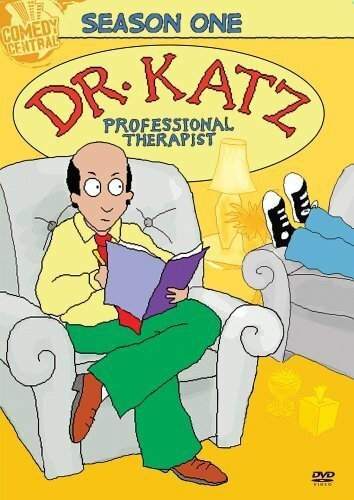 '90s TV toon therapist: DR KATZ. Looks like a fun cartoon. I've never heard of it though. No idea. Katze is German for "cat". Don't know what Katz means. 98. Vocalist Judd: NAOMI. So is Wynonna. 100. Excessive: UNDUE. As undue/excessive force. 103. Its symbol is Sn: TIN. Oh, good to learn. 109. Mavs' city: BIG D. Dallas Mavericks the NBA team. 110. Like the pre-coll. supplies market: ELHI. EL(ementary) + HI(gh School). 112. The NFL's Mannings, e.g. : QBS. Eli Manning & Peyton Manning are both quarterbacks. 115. Portuguese "she": ELA. It's always clued as "Guido's high note" in our old puzzle. 117. P. & L. column heading: YTD (Year to Date). P. &L. = Profit & Loss. I was at sea. This grid is so atypical of Alan Olschwang. I don't remember his puzzles being so scrabbly: 4 Z's, 2 J's, 1 X, 1 Q and 2 V's. Only 1 letter F away from a pangram (all 26 letters are used at least once in the grid). I guess I was used to his old TMS Daily Thursday quote style. Tough puzzle for me. Quite a few unknowns. Some struck me as a bit obscure. Take CET (10D. Belgium winter hrs.) for example. I've been to Brussels several times. Don't recall seeing CET (Central European Time) at all. GMT +1 yes, same as Paris. Favorite fill today is ZAHARIAS (39D. Golfer Babe who was a six-time AP Female Athlete of the Year). A rare long gimme for me (golf trivia is my strong suit). Babe was the founding member of LPGA and won over 80 tournaments in her career. Definitely the best female althelete of all time, with her track & field and other sports success. 1. King overthrown by William of Orange: JAMES II. Tough start. William of Orange sounds like a Dutch king. The Dutch House of Orange. 15. Conversion gadget: ADAPTOR. Adapter too. 17. Dennis the Menace's neighbors, with "the": WILSONS. I thought Dennis the Menace is a rather cute name. Surprised that Dennis hated it. 18. "Told you! ": SO THERE! 19. Zen enlightenment: SATORI. Literally "awakening". Japanese Kanji character satori is the same as Chinese. 20. Certain theater, for short: REP. Stumper. REP is repertory. 21. Berkshire school: ETON. Easy guess. I did not really know the exact location of Eton. 22. Carmen, for one: MEZZO-SOPRANO. Completely out of my knowledge zone. A gimme for our Sallie, hopefully. She loves opera. 25. Bad start? : MAL. Like malfunction. 29. Fork in the road: VEE. Struggled with the answer also. 30. Caribbean cruise stop: ARUBA. Dutch territory. 33. Inexpensive kids' toy: PAPER DOLL. Somehow I don't connect paper doll with "toy". 38. Maker of many jets: JACUZZI. Oh, jet stream. I was thinking of jet plane. Very scrabbly answer. 40. Asmara is its capital: ERITREA. A province of Ethiopia until 1993. Last time we had ASMARA clued as "Eritrea capital". 41. One in a box: SPECTATOR. Box seat. I was picturing a present. 43. Nutritious beans: SOYAS. Soybeans. 45. Big affairs: DOS. Big galas. 47. Classic Jag: XKE. What does XKE stand for? 48. Spinach is high in it: BETA CAROTENE. Well, I associate carrots/sweet potatoes with beta carotene, not spinach, which is high in iron. 55. Robot play: R. U. R. (Rossum's Universal Robots). The Capek play which debuted the word "robot". 56. Company with a kangaroo on its logo: QANTAS. A Q word without the U. Kazie just mentioned last time that Qantas is an acronym for "Queensland and Northern Territory Aerial Services". 63. "Sleepless in Seattle" studio: TRISTAR. Unknown fact to me. 64. One who aches: YEARNER. Argyle is still bothered by last time's RE-ADDS. 65. Party leader: HOSTESS. Was thinking of political party. 66. Brisk, to Brahms: ALLEGRO. Brisk tempo. 1. 1975 thriller shot largely on Martha's Vineyard: JAWS. Have never seen the movie. 2. 1998 Sarah McLachlan hit: ADIA. Don't confuse it with the "Verdi slave girl" AIDA. 4. Derby town: EPSOM. English derby. 7. Org. that gets a lot of returns: IRS. Tax returns. I outsmarted myself by thinking of tennis returns. 12. 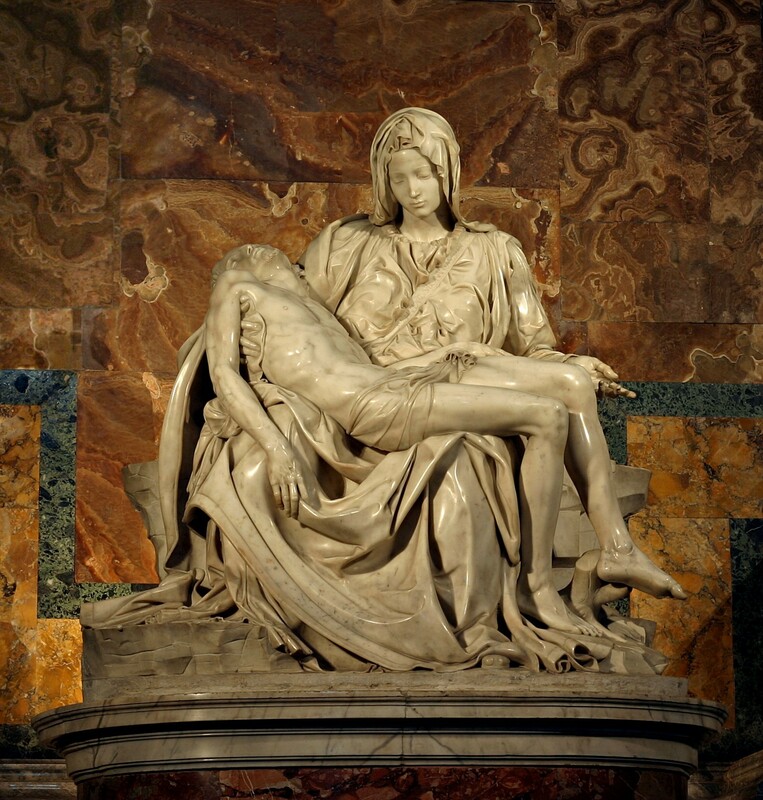 Michelangelo masterpiece: PIETA. See the sculpture, which depicts Virgin Mary mourning Jesus after the Crucifixion. It's housed in St. Peter's Basilica in the Vatican City. 13. Former Tennessee Titans tight end Kinney: ERRON. Nope. Total stranger to me. 14. Court figure: STENO. Judge's court. I was in the sports direction again. 20. Santa __: Sonoma County seat: ROSA. No idea. What is it famous for? 23. "Shh! ": ZIP IT. QUIET would not fit. 24. Sprites of Persian mythology: PERIS (PEE-ees). A word I keep learning and keep forgetting. 27. Fortune founder: LUCE (Henry). Founder of Time/Life as well. 31. Romania's capital: BUCHAREST. Alas, I only know the Chinese word for this capital. 34. Dallas Mavericks owner before Cuban: PEROT. H. Ross Perot, Jr. Son of Ross Perot. Again, I was oblivious to this fact. 35. Antelope that often has nearly upright horns: ORYX. See this picture. Nearly upright horns indeed. It's not listed in JD's Safari antelope list. 42. It may be fishy: ODOR. Nailed it. 48. Distance maintained between vessels: BERTH. Origin for "Give a wide berth" I presume. 49. Hot time in Chile: ENERO. Spanish for January. It's summer time in Chile. Great clue. 50. 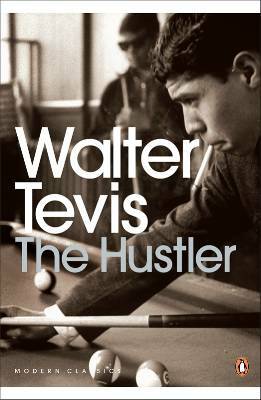 "The Hustler" author Walter: TEVIS. See the book cover. Unknown author to me. Loved the movie. 51. Who's sorry now? : RUERS. Shouldn't the clue be "Who are sorry now?" 53. Between: Fr. : ENTRE. I don't like the abbreviated Fr. 57. Half a patio pair: TONG. For your grill. 58. "Violin Playing as I Teach It" author Leopold: AUER. Same pronunciation as "hour". Meaning "from the meadow" in German. I can never commit his name into my increasingly deteriorating memory. 59. Houston pro, locally: STRO. Houston Astros. 61. 66, e.g. : Abbr. : RTE. Route 66. 62. Knotted pile carpet: RYA (REE-uh). The Scandinavian rug. Why knotted? Theme: Medieval Times - Part of a common phrase is punnily substituted by a word of Medieval relevance. 17A. Medieval commuter between Dover and Calais? : CHANNEL SERF. Channel Surf. Medieval commuter = Serf. 22A. Medieval castle owner's view? : BARON LANDSCAPE. Barren Landscape. Medieval castle owner = Baron. 34A. Manages medieval real estate holdings? : MINDS ONE'S MANORS. Minds One's Manners. Medieval real estate = Manors. 46A. Medieval lord's efforts? : FEUDAL ATTEMPTS. Futile Attempts. Medieval lord's = Feudal. 53. Weapons for medieval warriors? : KNIGHT CLUBS. Night Clubs. Medieval warrior = Knight. Today's Dan Naddor Index (non-theme entries with 6 or more letters) is 10. Low due to the heavy themage (65 theme squares). How is your solving experience today? I felt awfully inadequate. Peeked at my cheat sheet very early on. Puns are often difficult for me to grasp. Lots of tricky clues today. I fell into every possible trap. 1. Like litigants: SUING. Adjective. "Litigants" would be SUERS. 11. Onetime lottery org. : SSS. Military draft. 14. Block house: IGLOO. Ice block. 15. Jack of "The Great Dictator": OAKIE. Gosh, I can never remember his name. 16. Make a scene? : ACT. Nailed it. 19. Revolutionary leader: MAO (Ze-Dong). Culture Revolution (1966-1976) that prosecuted Chinese intellectuals. I penned in CHE (Guevara) first. 20. 1994 co-Nobelist with Rabin and Arafat: PERES (Shimon). Gimme. 28. Geezer: COOT. So is codger. 29. Hope contributed to it for 50 yrs. : USO. Bob Hope was famous for his work with USO. Great golfer too. 39. 1950s Edward R. Murrow news show: SEE IT NOW. I only remember the show ends with NOW. It's been some time since I watched "Good Night, and Good Luck"
40. "Thugz Mansion" rapper: NAS. Just learned that his given name is Nasir. 41. Mover or shaker: DOER. Nice clue. 42. Threaten to attack: ASSAULT. "Threaten"? I thought assault means "attack" itself. 52. 007, for one: Abbr. : AGT. The "Abbr." hint should prevent you from considering SPY. 59. Flop preceder: KER. Put down EAR. 61. Country known for its distance runners: KENYA. I wonder where their speed and endurance come from. 1. [error left as is]: SIC. The bracket indicates the mistake is quoted verbatim. 2. You might close your eyes when you say it: UGH. Oh, I never close my eyes when I say "Ugh". 6. One way to be responsible: SOLELY. Solely responsible. Excellent clue. 7. Tuscan marble city: MASSA (MAHS-sah). Nope. Here is a DF marble fountain in Massa. 9. Inflation cause? : AIR. Nailed it also. 10. Whistle blower: REF. Simple & tricky clue. 11. Island group near Fiji: SAMOA. OK, Samoa is in the northeast of Fiji. Stumped me. 12. Sell at an inflated price: SCALP. It's legal in Minnesota. 13. It's a wrap: STOLE. Last time SAREE was clued this way. 21. 747 competitor: DC-TEN. No idea. What does DC stand for, Dennis? 22. Count in jazz: BASIE. Count Basie. 24. CBS military drama: NCIS (Naval Criminal Investigative Service). Are you a fan? 26. "Brave New World" drug: SOMA. Unknown to me. 30. "A __ Good Men": FEW. "You can't handle the truth!". 31. Coffee mate? : DONUT. Mine was CREAM, despite the question mark warning. 35. Bad Boy Records founder, as he's now known: DIDDY. A rare gimme for me. P. Diddy, J-Lo's ex-flame. 37. First-year law student: ONE-L. L stands for "law". Also the book title of Scott Turow's biography. Very intense. 42. Besides: AT THAT. Thought of Melissa Bee. Her blog name is "Bee Sides". 43. Rockefeller Center muralist: SERT (José María). Spanish muralist. I forgot again. 44. Preschoolers' protection: SMOCKS. Oh, I don't associate smocks with preschoolers. 45. Task-oriented program: APPLET. Often abbreviated as APP. 47. Peak near the Jungfrau: EIGER. Swiss Alpine peak. Jungfrau is German for "young woman'/"virgin". Jung = young. 49. Some USAF NCOs: T. SGTS (Technical Sergeants). New to me also. 53. The Sunflower St.: KAN. Did not know sunflower is Kansas' state flower. 55. Pique condition? : IRE. "Piqued" would have lost the wordplay on "peak condition". 56. Nice one? : UNE. French for "one". Nice refers to French city Nice. Theme: Happy Turkey Day - A Thanksgiving Puzzle. 17A. Turkey: BIRD THAT GOBBLES. Or bird on your table today. 27A. Turkey: FRANK WAY TO TALK. Talk turkey. 48A. Turkey: THEATRICAL FLOP. Feared by some angels (financial backers). 63A. Turkey? : FRIDAY'S SANDWICH. A bit strained, no? Maybe that's the reason for the question mark. Then we also have an exotic "Turkish currency" clue for LIRA (3D), which is often clued as old Italian bread/currency. Alas, no "three strikes in a row", the turkey my husband likes the most, too many letters (18). Today's puzzle is by our editor Rich Norris. Lila Cherry is his alias name, anagram of "Really Rich". Thanks for the daily entertainment, Rich. And Happy Thanksgiving, everyone. Happy Feasting! 1. First name in folk: ARLO (Guthrie). He's in Woodstock, drunk and high. 5. Kick (out): DRUM. Did not come to me readily. Simple answer often stumps me. 14. Judge's determination: BAIL. Can you clue NO BAIL the same way? 15. Moira's "Chaplin" role: OONA. Easy guess. 16. TV exec Arledge: ROONE. The ex-Chairman of ABC News. 21. Cooked: DONE. My special Jeannie's stuffing is done. Delicious! I added a small can of water chestnuts. 22. Closed sac: CYST. Fluid-filled. 23. Neo, for one: Abbr. : ANAG. Neo is an ANAG (anagram) of one. Got me. 33. NASA transport: LEM (Lunar Excursion Module). 35. Shaq of the NBA: O'NEAL. Now with the Cleveland Cavaliers. 37. Sacred bird of old Egypt: IBIS. Sacred indeed. Not fond of the bird/BIRD (17A) duplication though. 39. Savvy: SENSE. Like business/political savvy. 42. "La Gioconda" tenor role: ENZO. Uh-uh, nope. I bet "Auto designer Ferrari" knows. The name Enzo means "Ruler of the Home" in Italian. 52. Lake surrounding Canada's southernmost point: ERIE. Nice trivia. 53. Dodge Aries, e.g. : K-CAR. What does K stand for? 59. 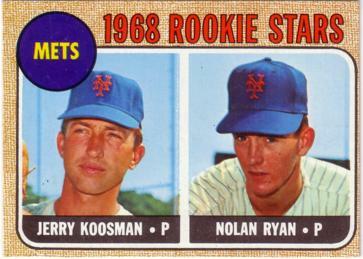 Like seven Nolan Ryan games: NO-HIT. A major league record. No perfect game from Nolan Ryan though. That's his rookie card. 66. Fast traveler, at times: RUMOR. Great clue. 67. Caesar's "Behold! ": ECCE. Latin. The Italian for "Behold!" is ECCO. 68. China's __ Enlai: ZHOU. Or CHOW in Cantonese. China's first premier. Yesterday's Mao Ze-Dong is Mandarin Chinese. Mao Tse-Tung is Cantonese spelling. 69. Last in a series: OMEGA. The last of Greek alphabet (24 letters). 71. Shakespearean "over there": YOND. Why do we add "er" later on then? 2. Travel option: RAIL. Can never read on a train/car. It makes me sick. 5. "Stupid me! ": D'OH. Carol's V-8 moment. 8. Sticker? : MAGNET. It sticks to your fridge. 9. Wall St. figure who capitalizes on price imbalances: ARB (Arbitrager). Like those hedge fund guys. 10. "Hogan's Heroes" star: BOB CRANE. Penned in ALAN ALDA, confusing "Hogan's Heroes " with "M*A*S*H". 18. Toy truck maker: TONKA. Originated in Minnesota. 19. Napa prefix: OENO. Prefix for wine. Napa is wine region. My favorite clue today. 29. "Witness" sect: AMISH. The little Amish boy is the sole witness to the murder in the movie. 30. Greek New Age keyboardist: YANNI. University of Minnesota alumnus. 31. Three-time U.S. Open winner: LENDL (Ivan). So is Tiger Woods, but in golf. 40. Awkward-looking picnic contest: SACK RACE. Several nice two-worders in the Down fill today. 41. Rescue op: EVAC (Evacuation). Solid abbreviation in my book. Pinkerton provided EVAC services for expatriates in China. 44. "Babi __": Yevtushenko poem: YAR. Babi Yar is the name of a ravine (outside Kiev) where Nazis murdered lots of Jewish people. I am not familiar with the poem. 46. African antelope: ELAND. J.D. must have seen this spiral-horned antelope during her Safari. 50. NutRageous bar maker: REESE'S. Have never tried NutRageious. Is it similar to Snickers? 51. Slovenly: FROWZY. New word to me. 54. Hendrix hairdo: AFRO. Buckeye just mentioned that tomorrow is Jimi Hendrix's birthday. 55. __ lily: calla: ARUM. I am used to the "Calla lily family" clue. 56. Coleridge work: RIME. No idea. Does it refer to his "The Rime of the Ancient Mariner"? 58. Author Sholem: ASCH. The Yiddish writer. 60. Sunshine cracker: HI-HO. Have never seen this brand. Wikipedia said it's discontinued. 64. Altar in the sky: ARA. Latin for "altar". 65. Actor Beatty: NED. He's in "Deliverance". Quite a disturbing movie. What's your family traditional Thanksgiving meal like? We always have wild rice and mashed rutabaga. Yikes! I never imagined seeing that here. Or anywhere else, for that matter. 17A: 360 degree artwork: CYCLORAMA. Never heard of it. 26A: Former resident of Lhasa's Potala Palace: DALAI LAMA. Easy answer. Hard to spell. Had to rely on perps. 41A: Wildly exciting, in slang: RING-A-DING. OK, I guess - but not very common. 52A: Long Time Chinese Leader: MAO ZEDONG. Another easy answer, but a real spelling challenge. And 43D Named for a car model, group who sang the 1961 hit formed by the end of 17-, 26-, 41-, and 52-Across: EDSELS. I went from Freshman to Sophomore in High School in 1961. I remember the song, almost, and the car, but not the group. The YouTube link says 1957-58, not 1961, and that sounds right to me. Hi, gang - it's Jazzbumpa, your displaced OHIOAN trombonist. Let's dedicate today's puzzle to Buckeye and Crockett. Hope I didn't miss anyone. Rather a fun puzzle. I had no clue on the theme until I got to 43 D.
Quite a few long fills and nice 5-stacks. I counted 36 black squares. Let's work it out. 1A Workout room: GYM. Dennis can give us the details. 4A Bit of hardware: SCREW. I think of it as a machine part, but hardware is OK, too. Other meanings are possible. 9A Suffix with sea: SCAPE. I wasn't sure what to expect here. Had to get perp help. 14A Extinct ostrich like bird: MOA. The MOA, the merrier. Too bad they're gone. 15A Games authority: HOYLE. He wrote the book on many card games. 16A Give_________: care: A HOOT. I tried A DAMN first, thinking about Rhett and Scarlet. Then I got A____T from the perps, and was a bit concerned for a while. 19A Hardly the gregarious type: LONER. Thought of this guy. Wonder if he's in solitary confinement? 20A Buckeye: OHIOAN. Needs no explanation. But here, anyway. I have a semi-closely related horse chestnut tree in my backyard. I think Buckeyes were declared illegal in Michigan last Saturday. We had a great time at the game and tailgating, but the outcome was sure hard on the locals. 21A "Skip the sordid details." SPARE ME. Or a bowler requesting assistance on a 7-10, perhaps. 23A Like many Airports: Abbr. : INTL. Internal, like near the center of a continent. Oh, wait - maybe it's international. 24 A ________ FIRMA: TERRA. Well, what else could it be? 25A Well fluids: INKS. The stuff in the ink well. Nice, clever clue, it you're old enough to remember ink wells. Did anybody under about 50 have trouble with this? 30 A God of hawks: ARES. We think of him as the god of war, and therefore hawks = warmongers. But Wikipedia points out that ARES is the god of bloodlust and slaughter. Lovely. 31 A Gear part: COG. A single tooth, a cogwheel, or someone like Mongo, only pawn in game of life. 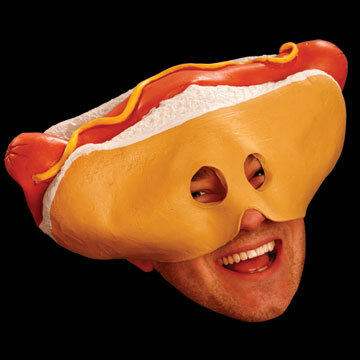 32 A Frank: WEENIE. I stumbled all over this one. Like Diogenes, I was looking for an honest man. Or at least some nice buns. 33A Fanzine, e.g. MAG Abbrv. fr. Mgzn. I gss. 36A Old Prizm automaker: GEO. And 1D Canyon or Sierra: GMC. Correct, and correct. This time there can be no dispute. 37A Represent as Identical: EQUATE. Do you equate EQUATE with "make identical?" How about correspond, match, similar or analogous? Just askin . . .
39 A _______ And outs. INS. Are they talking about doorways, or something else? 40 A East Berlin's Cold War Counterpart: BONN The two capital cities. 43 A Guesses "true" when the answer is false: ERRS. Or drops the ball. It's only human. 44 A Pulizer winner Walker: ALICE. Won Pulizer Prize for "The Color Purple." I forgot. 46A Golfer who won the 1992 U.S. Open: TOM KITE. I couldn't tell you who won the 2009 U.S. Open. 49A Prescription measure: DOSAGE. It's just the right amount. 51 A Nebraska city: OMAHA Founded in 1854, the nations 42nd largest city. 55 A Boston Airport: LOGAN. It's just about surrounded by water. 56 A Throw out: EXPEL. Like, from school. 57 A Nitrogen based dye: AZO. Al? Dr. Dad? 58 A Pork Cuts: LOINS. Them's good eatin'! 59 A Essentials: NEEDS. If you need it, it's essential. 60 A Go one better. TOP. Lions over Browns. Crazy finish. 2 D Toy on a string: YOYO. Or a honker, dinger YOYO jamboree. 3 D Rapid fire weapon: MACHINE GUN. Rat-a-tat-tat. 4 D "Eats, ______, & Leaves" : Punctuation handbook: SHOOTS. Beware of koalas with MACHINE GUNS. 5 D Reef Stuff: CORAL And starfish fodder. 6 D "Saving Private ______" RYAN War really is hell. 7 D Common street name: ELM Formerly, a common tree. Now ash is in trouble, too. 8 D Cunning sort: WEASEL. Seems wrong. Should be "a sneaky, untrustworthy, or insincere person". 9 D Not paid hourly: SALARIED. Either way, it's take home pay. 10 D Bach Work: CHORALE Bah! I can't find a YouTube link to one actually being sung. We'll have to settle for this. 11 D Superior: A ONE. Or Minnesota's Lake. 12 D Keats work: POEM Better than a Yeats work, C.A.? 13 D Raison d'_________: Reason for being: ETRE. A bit strained, IMHO. 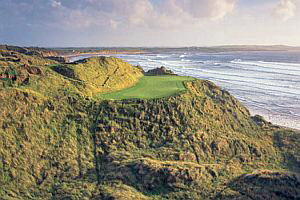 18 D Golf course: LINKS. Or breakfast before a round, perhaps. 22 D Shrimp like crustaceans: PRAWNS Anybody know the difference? 24 D "In space no one can hear you scream" for "Alien. ": TAG LINE A memorable branding slogan used in advertising. 26 D Forest female: DOE. And the start of a genuinely horrible song. I won't link to it. 27 D Source of mohair: ANGORA GOAT Rather a handsome fellow. 28 D Bearings: MIENS I wanted more machine parts, not demeanor. 29 D Near eternity: AEON When you need a bunch of vowels, you need a bunch of vowels! 30 D From the U.S.: AMER. Abbrv. in Cl. Abbrv. in Ans. 31 D Cash Alternative: CREDIT Use it if you have it. 35 D Director Lee: ANG Crouching Tiger, Hidden Dragon, Brokeback Mountain, etc. 38 D Shi'ite leader: AGA KHAN The hereditary title of the Imam of the Nizārī Muslims, I had no idea. 40 D Server's basketful: BREAD In a retaurant, or at the sermon on the mount, with fish. 42 D Bygone bringers of cold blocks: ICE MEN They were cool. 45 D Leaked Slowly: OOZED. The word sounds viscous and slimey. 46 D Turnpike fee: TOLL To pay for the snack, I suppose. 47 D Melville Novel: OMOO. Unknown outside of crosswords. 48 D "The gift of the___": MAGI Sad, ironic story of loving and giving, by O Henry. 49 D Info: DOPE I haven't heard it used this way in AEONS. 50 D Auto designer Ferrari: ENZO. Must have a picture. 53 D Stump creator: AXE Sharp clue. 54 D Red State Org. : GOP. Grand Old Party. The erstwhile party of Lincoln. 'Nuff said. Pictures of the Day: Here are four fantastic photos J.D. took during her Safari expedition. Click on each one, the picture will enlarge. Theme: Homophones - The last words of the three theme answers are homophones. The bees (Barb & Melissa) blogging. We didn't recognize the constructor's name. So we looked him up. Gary Whitehead is a poet, painter, teacher and crossword constructor. Get this. He also wrote this piece for the Christian Science Monitor titled A question of morels. Homophones are words that are pronounced the same, but are different in spelling and meaning. PALLET can also mean a mattress or small, temporary bed. There are probably a lot of visiting family members sleeping on pallets this week. That might be next for Barb B, a.k.a. Goldilocks. The futon is too hard, and the couch is too soft. Maybe a pallet would be just right. Or maybe she just needs a massage. Lots of expensive scrabbly letters, but alas, no K, Q or W.
1: Job detail, briefly: SPEC. 14: Prefix with space: AERO. 15: Really peeved: IRATE. Michael Smith's famous mad bluebird photograph. What's your pet peeve? 16: Campus south of Sunset Blvd: UCLA. 23: B&Bs: INNS. Mother and daughter, too. 24: Jane Fonda, to Peter: SIS. 28: Airing, as an ESPN game: ON TV. 33: See eye to eye: AGREE. 34: "Night" author Wiesel: ELIE. 39: Datebook entry: Abbr. : APPT. 40: Improves in the wine cellar: AGES. 42: Guitarist ____ Paul: LES. June 9, 1915 – August 12, 2009. Moonglow. RIP Les. 43: 1982 Disney sci-fi movie: TRON. 46: Sargasso et al. : SEAS. The Sargasso Sea is in the heart of the Bermuda Triangle, and named for the sargassum seaweed that floats in it. Wide Sargasso Sea is a prequel to Jane Eyre, made into a movie. 53: "The Haj" novelist: URIS. Haj = pilgrimage to Mecca. Haji = one who has made a pilgrimage. Who remembers this Hadji? 55: Giant screen format: IMAX. 58: Els on the links: ERNIE. Crossword staple. Currently ranked 16th. Career earnings: $35,810,558. 59: Free from doubt: SURE. And 4D: Free from doubt: CONFIDENT. Nice echo. Nice echo. 60: Foreboding date for Caesar: IDES. 2: Anjou or Bosc: PEAR. Homophones: pair and pare. 5: California senator Feinstein: DIANNE. 7: Robinhood's merry men, e.g. : BAND. Including Maid Marion and Friar Tuck. 8: Longhorn State sch. : UTEP. University of Texas at El Paso. 9: Oil, informally: TEXAS TEA. 12: Tickled-pink feeling: GLEE. Right Dennis? 21: Bay or cove: INLET. 22: Actress Tyler: LIV. Aerosmith's Steven Tyler's daughter. 25: Of the Holy See: PAPAL. "See" comes from the Latin word sedes, meaning the seat or residence of the bishop. 28: Jimmy of the Daily Planet: OLSEN. 30: Gangster dubbed "The Teflon Don": GOTTI. Dapper Don. John Gotti Jr. is following in his father's footsteps. He's on trial for racketeering and murder, current jury deadlocked after three hung juries. 35: Academic honor: DEAN'S LIST. 37: Tea named for William IV's prime minister: EARL GREY. Infused with bergamot. 38: True blue: LOYAL. Hey! What? 43: Mai ___: cocktail: TAI. 45: Roaches, ants, etc. : PESTS. 46. Bowler's headache: SPLIT. Also the word that starts Bananagram game. We've been playing. Barb B keeps winning. 48. Greet the day: RISE. 49: Cocksure Aesopian racer: HARE. 50: "Saturday Night Live" alum Fey: TINA. 51: Outback runners: EMUS. Have you tried Emu oil? 52: O'Hara home: TARA. Rhymes. 53: Action film gun: UZI. 56: Gen-____: boomer's kid, usually: XER. Generation X. Theme: Lower Body Parts - Clothing items starting with a word indicating "lower body part". 17A: Beatles footwear: ANKLE BOOTS. 66A: Stockinglike workout wear: LEG WARMERS. 10D: Goalie's protective pair: SHIN GUARDS. 30D: Pants with a low waistline: HIP HUGGERS. Argyle here. It seemed a little loose today. The theme was muddled by the inclusion of other body parts. 27A: Seasoned pros: OLD HANDS, 50A: Sledding spot: HILL SIDE and 49D: Winter hat feature: EAR LAP. 1A: Closes in anger, as a door: SLAMS. 6A: Cause damage to: HARM. From slamming too hard? 10A: Cover for a pillow: SHAM. 14A: Psychic's card: TAROT. A. Tarot, are you still with us? 15A: Belle man: BEAU. BEAU of the ball. 20A: In a dishonorable way: BASELY. 21A: Japanese electronics giant: NEC. Nippon Electronics Corporation, mostly in computer related products and net working. 22A: Pinot __: NOIR. Grapes and wine. It is a difficult variety to cultivate and transform into wine. 32A: The "T" in some fraternity initials: TAU. 33A: 503, in old Rome: DIII. 34A: Casa kitchen crock: OLLA. 40A: Like the diving-board end: DEEP. I got caught thinking it referred to the board itself and not the pool. 41A: WWII noncombat females: WAACS. Women's Army Auxiliary Corps. Sloppy clue, should have said something about being service related. Were there any combat females? ; I think not. 44A: Seaweed-wrapped Japanese fare: SUSHI. 46A: Analogy phrase: IS TO. 47A: Contest with pistols: DUEL. I still laugh when I think of our school advertising a DUEL(dual) position. 48A: Put into service: USE. 52A: Word game involving a stick figure: HANG MAN. 56A: "No way, laddie! ": NAE. 60A: Double-checks the math: READDS. Boo! 70A: Words after have or save: A SEAT. 72A: Sampras of tennis: PETE. 73A: Burial places : TOMBS. 1D: Wild guess: STAB. aka, WAG. 3D: Boats like Noah's: ARKS. 5D: "A Streetcar Named Desire" woman: STELLA. Stella! 6D: "Real Time With Bill Maher" network: HBO. 12D: Computer text code: ASCII. American Standard Code for Information Interchange. I admit I always thought it was ASC II, you know, like the second version. 13D: Anne of "Archie Bunker's Place": MEARA. The show aired for four seasons, '79-'83. Anne Meara played Veronica Rooney (1979-1982), the cook at Archie Bunker's Place, the bar Archie bought. She and her husband were the Stiller and Meara comedy duo. 18D: "See ya later": BYE NOW. 24D: Stevenson who lost twice to Eisenhower: ADLAI. 26D: "Apocalypse Now" setting, briefly: NAM. 31D: Cut dramatically: SLASH. 39D: Bargain hunter's delight: SALE. 35D: Join the cast of: ACT IN. 42D: Sporty Toyota Camry: SOLARA. A mid-size coupe/convertible. 45D: Suffix with intellectual: ISM. 52D: Mythological underworld: HADES. Greek. 54D: Octet plus one: NONET. 59D: Corp. leadership gp. : MGMT. management. 61D: "I __ busted! ": AM SO. I thought of Dennis and his "False Confession Day"
64D: Retd. Air France fliers: SSTS. But they will never retire as crossword fill. 67D: Like early morning hours : WEE.